Towers are lowering to the ground in the flood. The availability of rooms we all enjoy amongst the frescoes are slipping away. Art defines who we are, our faces stare like emperors lost in a terrible moment of catastrophe. The strength of Venice is to the hilt. Suddenly her boats are ripped up and they flail a faked exit to try to maintain their lives. There is blame always in the air as to why the canal has burst the banks. All we remember is opening our eyes to find water around us. There is a man in the market who is compelled to stay as if he cannot leave the crime. He is a tiny man who is well dressed but only trades in Murano glass that is plentiful off the lagoon. He never takes a day off. The finger of suspicion slowly falls on him in a way that silence indicates mostly what we would like to say but dare not. Today the Doge’s Palace does not take in any new visitors for the chaos has taken hold of our own personal travel itinerary. The local crowd that cannot go home and leave their trade for even one moment wonder at how this state will work without the ebb and flow of tourists. The gold coins in my pockets are fidgeted with and rubbed together like the bag of voting balls that goes around the committee nominating the Doge. The flowers wilt in the salt water and become soppy but the scent on the air whips up the water. We feel the stare of the Doge on our backs though he is nowhere to be seen. The tiny man is shaking in his slightly over sized clothes and a sweat wets his jacket so darkening the shiny colours that pop out to the eye. It is time for a kill. ‘Where are you from? Which Island?’ asks a faceless voice emboldened by the pack mentality. I now find out how he really makes a living. Not glass at all. There is a rope tossed to the ground. It is full of tar. The flames from a carnival have charred it. Our knees are bathed in the water bound for the land. We are too old to begin again. Our friendships are not so firm they will survive this. We watch the tiny man swim away. We see his face a few times in the distance. There are boats struggling his efforts will be for nought. Driftwood is scattered and will be his lottery ticket for survival. It’s a free market in Venice, and it has its own version of democracy. I claimed his reddest marble with one gold coin, now lost. Thrown to Neptune on an impulse. As I elaborate I stare through the window to the waters now emptying into the committee room of the Palace. The fresco is stripped of faces. The likenesses are gone. When he has sold all his glass a new artist will be commissioned. A linear journey through the Renaissance will be travelled and my face will be at the front. It will be reward enough. 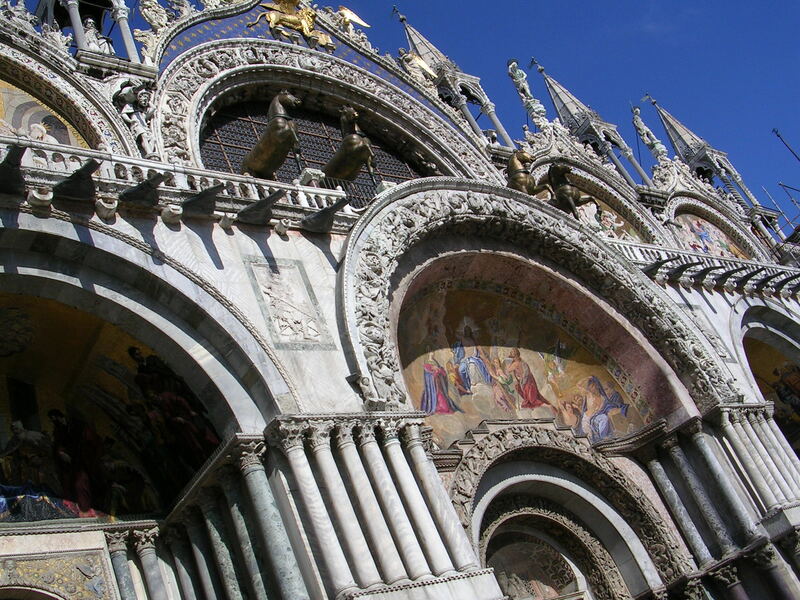 This entry was posted in Stories & Poetry, Uncategorized and tagged daily prompt, Doge, DPChallenge, fiction, Murano, short story, St Mark's, travelogue, Venice. Bookmark the permalink. Isn’t it? The golden horses on the front are my favourite. Love the way they shine so bright. Beautiful are your thoughts,is all I can say. Thank you for kind words Ranu. Hope you have a great weekend. I’m enjoying my visits to your site. Thanks so much. Enjoyed your post. That was cool and interesting! Thank you! I soooooo should be cleaning my messy house, but I’m drinking an extra large cup of tea and enjoying everyone’s blogs! 🙂 I hope you have an awesome weekend, too (raises tea cup)!! I’m ready for cup number two! (Although, my cup is so big that it will probably be cup #4!) 🙂 Cheers right back atcha! It’s so beautiful isn’t it? I haven’t spent that much time there but whenever I go it just claims the soul! Lovely to hear from you. I enjoy your blog immensely. It is an amazing place indeed… I used to go there quite often and I spent so many beautiful moments in that country… 🙂 Thank you for your kind words, I notice your presence and the frequent visits to my blog and I appreciate them! Wow, you write beautifully. Every word was a treat to read ! Thank you for these kind words! Such a beautiful place to write about. Just had a great time checking out your brilliant photos on your blog! Thank you so much for visiting and liking my photographs. I try. I love photography but I don’t have a professional camera so I have to make do with mobile camera. Irresistibly good! Feels like I was there as the words come to life. Have a great weekend. Ah you too. Have a good one. Nice to hear from you as always! Reading your post felt like I’ve been to this place. 🙂 Beautiful Lita. Thank you! I am enjoying my visits to your blog. I been reading some of your enthralling posts there. Strong writing. Have a great week. Hello Gisela lovely to hear from you. Hope you are having a great week. So glad you liked my post. I wish Italy was everywhere, what a place, at least it is nice to write about it if I am not there! Looking forward to catching up on your superb poetry this weekend! Enjoying my visits to your blog. I almost applauded, speechless.It is phenomenal. Thank you! I am enjoying my visits to your website hugely. Inspiring posts. So glad you liked this. Have a great week.